best-selling book, The Voyage to Your Vision. We all have the capacity to become what we want to be and achieve what we want to contribute to the world. Each one of us is blessed with the unique skills and abilities that are needed to become successful. On the path to success, we will undergo a wonderful and adventurous voyage. 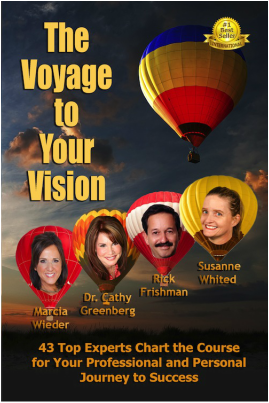 In the newly released book, The Voyage To Your Vision, experts from across the globe gather to share the wisdom from their vast experiences with others and change lives during our turbulent times. Making the decision as to what we want our life to look like personally and professionally is not an easy task, as it requires the balance of our abilities, skills and our passion. However, if we are clear in our choice, our minds and actions will be gracefully guided on the path to reach our goals. Being successful is not just about reaching the goal; it can also be measured on what we are willing to do in order to see our mission fulfilled. As we experience challenges, we become stronger. When we are willing to share these experiences with others, they can become invaluable, change lives and help others define and achieve their success. You can get an autographed (by me) softcover or an electronic book. After you order your softcover, I will email you to get the specific inscription you wish (within reason). You will also receive a complimentary copy of the electronic version. Please allow two to four weeks for shipping of your autographed copy. Your complimentary copy of the electronic version will be emailed to you after your order has been processed by my office staff. All sales are final. There are no returns on these products. You can also get your copy from Amazon! Experts: Adriana Ellis, Allen Klein, Anne Redelfs, MD, Rev. M. Azima Jackson, MS, DMin, Barbara Bamba, Beverly Bergman, Brandy Faith Weld, Carol Davies, Carolyn Gross, Dr. Cathy L. Greenberg, Chaffee-Thanh Nguyen, Clint Arthur, Deberah Bringelson, Denise Joy Thompson, Divya Parekh, Donald Gilbert, Ph.D., Dorothy Kuhn, Drew Hunthausen, Elizabeth Olagunju, Dr. Francesca A. Jackson, Geri Portnoy, Gerry Wilson, Shari Yantes, Gary Barnes, Hal Price, Jan Michael Gaynor, Lauren Perotti, Dr. Louise Finlayson, Luis Vicente Garcia, Dr. Mamiko Odegard, Marcia Wieder, Professor Marilyn Horowitz, Mike Fritz, Nano Daemon, Paul Lawrence Vann, Dr. Richard Eley, Rick Frishman, Sabrina Williams, Dr. Simone Ravicz, Susanne Whited, Terry Zweifel, Dr. Tianna Conte, ND, and Viki Winterton.